We are back on the mission of following the Lewis and Clark Trail and have moved north and east to Mobridge South Dakota. Mobridge is a small city on the Missouri River that got its name when the bridge over the river was being built in 1924. A telegraph operator abbreviated when he transmitted Mo bridge completed and the city gained its name. There were 5 Missouri River bridges being built in South Dakota at the time and it was a grand accomplishment to be the first to finish the task. The Scherr-Howe Event Center is the city's auditorium. It is a small basketball arena with a stage on one side of the court and bleachers on the other. The space brought back fond memories of the small school in upstate New York where we both attended high school. Mural of Sacajawea with the expedition on the banks of the Missouri. The event center was built in the 1930's as a WPA project. We visited to see it's artwork. The sidewalls of the arena are painted with a series of 10 murals depicting the history of the Yanctonai Dakota as they began to interact with traders, explorers and settlers. 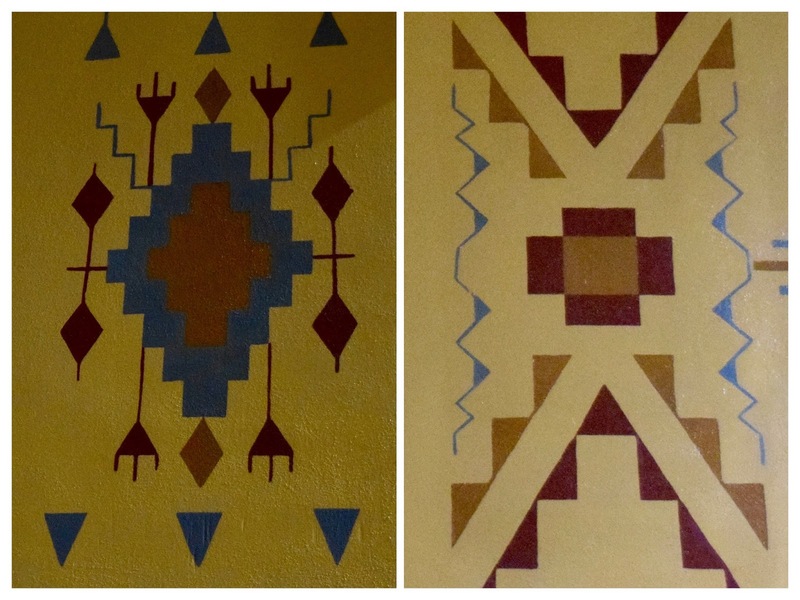 The murals were painted by Oscar Howe as part of the WPA project. They were completed in 1942. Mr. Howe joined the military when the United States entered WWII but was given a 12 day furlough to finish the murals before reporting for active duty. Oscar Howe is an accomplished Native American artist and these are some of his earliest works. Border details around the event center complement the murals. We were particularly interested in the panel that highlights Sacajawea with members of the Lewis and Clark Expedition on the banks of the Missouri River. I also appreciated all of the patterned borders that decorated the spaces between the murals. Outside Mobridge, at the edge of the Standing Rock Sioux Reservation, there are 2 monuments on a bluff overlooking the Missouri River. The first is a large granite bust of the Hunkpapa Lakota Sioux leader Sitting Bull. The charismatic chief lead the people in their resistance of the US governments policies over their lands. He fought in Custer's defeat at the Battle of Little Bighorn, spent several years in exile in Canada, and later toured with Buffalo Bill's Wild West Show in an effort to bring attention to the plight of Native American people. He was killed in 1890 during an attempt to arrest him for alleged participation in the Ghost Dance movement. He was 59 years old. Sitting Bull was buried without ceremony at Fort Yates in South Dakota. His remains were stolen from that place in 1953 and moved here near the place of his birth. The bust that marks his grave was carved by sculptor Korczak Ziolkowski-the same artist that designed and began the Crazy Horse monument. Sacajawea is also remebered by a tall pillar and bronze plaque that describes the contributions of "Bird Woman" to the Lewis and Clark expedition. Sacajawea is believed to have died at the age of 25 at the nearby Fort Manuel Lisa. The only documentation of her death is a journal entry by trapper John Luttig on December 20, 1812. "This Evening the Wife of Charbonneau, a Snake Squaw, died of a putrid fever, she was a good and the best Women in the fort, aged abt 25 years she left a fine infant girl." The monument was erected in 1929 and was built with funds collected by local school children with a penny project. The expedition has traveled up the Missouri to present day Mobridge. They are feeling safer having had no further contact with the aggressive Teton Sioux. They passed a large inhabited island and were impressed with the fields planted with tobacco, corn, beans and squash. They later wrote of being fed a "boil" of those vegetables, referred to as the 3 sisters. The planting of these 3 vegetables together was intelligent farming. The cornstalks provided a strong upright for the beans to climb on and the squash plants with their broad leaves shaded the soil holding in moisture. The corn, beans and squash could be preserved by drying and eaten during the long Winter months. I have ordered Three Sisters Soup a few times since we left Nebraska. The soups I was served were flavored with seasonings that would not have been available to the Arikara, but the blend of 3 main ingredients is consistent. This recipe from the Food Network seems close to what I have enjoyed. William Clark wrote about the earth lodges of the people that he called Rickerees and we know to as the Arikara. Clark also described the Arikara's reaction to York. "Those Indians wer much astonished at my Servent they never Saw a black man before, all flocked around him & examined him from top to toe" He went on to tellof York's playing games with the children making himself "more turribul than we wished him to doe"
The Court Martial of Private John Newman was held. He was charged with insubordination and sentenced to 75 lashes. He was no longer permitted to work on the keel boat. He would remain with the party until Spring when he would be returned to St. Louis for discharge from the Army. This sentence upset the Arikara who had no experience of corporal punishment. Early the next morning the expedition set up river toward the Mandan. Their journal entries for that period of time describe ample hunting, sunny days full of beautiful scenery and relief from the constant annoyance of mosquitoes. Stephen Ambrose described that part of their journey in his book about the expedition Undaunted Courage. "If there ever was a time in which the Lewis and Clark Expedition bore some resemblance to a bunch of guys out on a long camping trip, it was the first part of October 1804"
From US Hwy 12 just west of the river in Mobridge turn South onto 1806 and drive 4 miles to the gravesite. I love that line from Undaunted Courage, Bonnie. Can you imagine the excitement they must have felt heading west into unknown territory? Its one of my favorite descriptions. It made me so happy to read that they were able to enjoy their time on the river instead of fighting it all day. The excitement,the wonder and the sheer terror must have been a potent mix.